Nearly two years after its historic encounter with the dwarf planet Pluto, NASA's New Horizons spacecraft is getting ready for its next big adventure in the icy outskirts of the solar system. Now, the spacecraft is on its way to a small, ancient object located about 1 billion miles (1.6 billion kilometers) beyond Pluto in the Kuiper Belt. This distant region surrounds the solar system and is filled with trillions of icy rocks that have yet to be explored. The new target was discovered by the Hubble Space Telescope in June 2014, and it was dubbed 2014 MU69. Artist's illustration of NASA's New Horizons probe flying through the Pluto system in July 2015. It took the spacecraft about 16 months to beam back all of its data from the Pluto flyby, and planetary scientists have had a ball with that data. "The New Horizons flyby of the Pluto system was completely successful, and now we've got all the data on the ground and we're putting a bow around it," Alan Stern, the New Horizons principal investigator at Southwest Research Institute, said in a Facebook Live event on Thursday (Jan. 19). Thanks to New Horizons, scientists now have a global map of Pluto and the most detailed images yet of the dwarf planet's bizarre, mountainous landscape and icy volcanoes. Tall mountain ranges seen on Pluto also suggest recent geological activity on the dwarf planet's surface. New Horizons additionally beamed back a gorgeous photo of a huge, heart-shaped basin (unofficially called "Tombaugh Regio") that quickly became Pluto's most famous feature, taking the internet by storm and gracing the front page of hundreds of newspapers worldwide. The New Horizons science team has said Pluto's "heart" seems to indicate the presence of a subsurface ocean. The Pluto flyby also provided an opportunity to study Pluto's moons, particularly Charon. Researchers discovered that Charon and Pluto are both tidally locked, meaning the same side of the moon always faces the dwarf planet and vice-versa. As a result, Pluto's heart is always facing Charon. A giant red spot discovered on Charon's surface revealed that the moon is taking some of its atmosphere from Pluto. "One thing that we discovered is that small planets can be just as complex as big planets, and that really blew away our expectations," Stern said, adding that all the new findings from Pluto "wet our appetite for future exploration of the Kuiper Belt." New Horizons' photo of Pluto showing the heart-shaped area now informally named "Tombaugh Regio"
While the team continues to analyze the plethora of data — something that could go on for decades — it's also busy planning for the next big stage of the mission, the flyby of 2014 MU69. That will occur in January 2019. 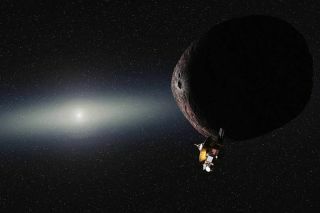 Pluto is the largest object known to exist in the Kuiper Belt, but MU69 is much smaller and more representative of the trillions of other KBOs, Kelsi Singer of the New Horizons science team told Space.com. Pluto is comparable to the size of North America at 1,475 miles (2,370 km) in diameter, while MU69 is less than 30 miles (about 45 km) across. But MU69 isn't just any old KBO. Singer said that the object "has a special kind of orbit that makes it possibly a type of object that is primordial and left over from early solar system formation. So we think that we'll be able to look at what the building blocks of the solar system were like by going to this special object that has a special orbit." This overhead diagram of the solar system shows New Horizons' full trajectory and current position. The green part of the line shows where New Horizons has already traveled, and the red shows the probe's future path to and beyond the Kuiper Belt Object 2014 MU69. Part of the rationale for choosing MU69 as the next target was that it had a good location given the amount of fuel left on the New Horizons spacecraft. "MU69 turned out to be really interesting, but we also had limited options," Singer said. Using the Hubble Space Telescope, "we were searching the area of space where we had enough fuel left in the spacecraft to get to any objects that were there," she said. Three good potential targets were located, but the other two "were just on the edge of where [the spacecraft] had enough fuel to get to." New Horizons runs on a radioactive plutonium power supply that could keep the spacecraft going through the mid-2030s, Glen Fountain, the New Horizons encounter project manager at Johns Hopkins University's Applied Physics Laboratory, said during the Facebook Live event. But after the 2019 flyby of MU69, the spacecraft probably won't have much fuel left for special maneuvers, Singer said. "We won't be able to switch directions, but we'll still keep going out. It's possible that we'll be able to observe some other objects, but we haven't identified any of them yet. So we're going to keep an eye out to see what we can find." For now, the team will remain focused on planning the MU69 flyby and sifting through data from Pluto. The researchers need to plan the spacecraft's every move far ahead of time; because of a 6-hour delay in communications with the distant spacecraft, they won't be able to tell the probe what to do in real time. Instead, the team must program New Horizons at least several months in advance to do every observation and data transmission. The spacecraft will take photos of MU69 along the way, starting out with pictures of a single-pixel speck from afar, Singer said. During the flyby, New Horizons will be able to get even closer to MU69 than it did with Pluto, because the small object has much less gravity. This means that the photos of MU69 will have a higher resolution than the photos of Pluto. Singer said that's something she and the team look forward to seeing. In April, New Horizons will be halfway to MU69 from Pluto, with 21 months of spaceflight left to go.